Paul Cook reckoned the 2-2 draw at Bristol City encapsulated Wigan Athletic's season on the road in a nutshell. 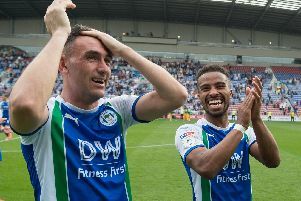 Latics deservedly held the lead on the hour mark through Reece James' world-class strike from 30 yards, with Josh Windass also hitting a post. But two goals in the space of four minutes around the three-quarter mark - both poor goals from a Latics point of view - turned the game completely on its head. Latics managed to hang in there and eventually found a stoppage-time equaliser from Anthony Pilkington - his first goal for the club. And Cook was left to reflect on an afternoon that underlined the strengths and weakness of his side. "From a managerial point of view the game probably summed up our season - in relation to the away form," the Latics boss said. "We just have that ability to have moments of madness during a game, and that can see us go from such a positive position to such a negative one. "Having said that, I thought we looked a threat all afternoon, in terms of creating chances. "And I genuinely felt a draw was the least we deserved for our efforts - but that's only my opinion. "We've had so many disappointments away from home, and it is tough on some of the lads within the group. "We're learning on the job and, at the level we're at, learning on the job can be tough. "When you give teams goals, and you see the atmosphere inside the stadium changes, their players grow...it can be tough to manage." The opening goal of the game is sure to be replayed many times over the coming days and weeks, with James picking up the ball on halfway before advancing and hitting a swerving effort into the top corner of the net. "Reece was outstanding again, and his goal epitomises where he is as a lad," gushed Cook. "He has so much self-confidence, and that self-confidence is backed up by his ability and his work ethic. "What he's done this season is shown everyone he's going to have a very strong football career. "And we're all delighted that Wigan Athletic has played a small part in that development."